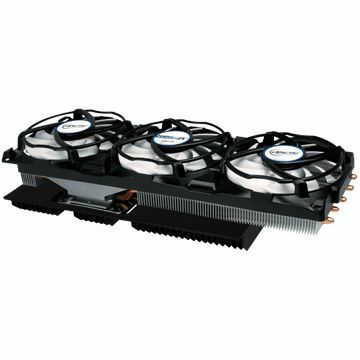 For many years, the cooling system for graphics cards Arctic Accelero Xtreme remains virtually unchanged, and indeed so successful in terms of constructive and cost radiator on the market simply do not have. But today, many manufacturers put on their cards initially good cooling system, the CO can provide a good or even excellent cooling of the GPU. Therefore, it would seem, the replacement of the cooling system is relevant only to refrain making, let’s check whether this is so. Today, we will look at Arctic Accelero Xtreme IV, this is how you have understood the fourth version of the Accelero Xtreme, which carries a fairly significant change in terms of the set and the final result. Arctic Accelero Xtreme IV comes in a bright, blue-white, oblong, small box. 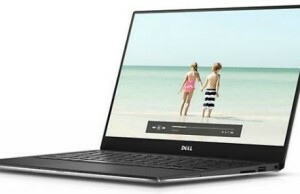 With an extensive description of the characteristics of the cooling system, data compatibility, and additional product information. The fourth version of the Accelero Xtreme is devoid of additional radiators for VRM and memory. Pretty long black radiator is covered Kamke, which has three 92mm fans, the overall size of the cooling system is 288x92x39mm. The thickness of the cooler is 39mm, which corresponds to three expansion slots after installing the video card, but it was in previous versions. Arctic Accelero Xtreme IV is installed only with the upper plate, radiator, and unfortunately the installation without it is not suitable, because the screws securing the cooling system is quite high and in any case they will construct a 4-slot. For over four generations of the radiator airflow always meets a trio of 92mm thickness 15mm fan. On each fan impeller has 11 curved blades long. The very white fan impeller, all installed in a black frame, and they are not removable. Radiator Arctic Accelero Xtreme IV is. One of the sections (Central) is a one-piece aluminum radiator and at the same time to the bottom of soldered heat pipes, thermal cutting in the construction of five. Copper heat pipes form two sections, small and large, they are threaded aluminum fins. Total 85sht ribs (15 + 70), the thickness of 0.3 mm, the distance between the edges of 1,7mm. Central heat sink mounted on the base has on itself as much as 40 ribs. Today we would rather unusual test card ASUS ROG POSEIDON GTX 980 (POSEIDON-GTX980-P-4GD5). It will be interesting to compare the test data to test the cooling system and in fact further the effectiveness of Poseidon. Initially set screws in the needed holes. Then they put on plastic pads 1.5mm thickness. Set the video card on top. Paving the thermo-reaching complete over the VRM and memory chips. A black porous pad set on GPU. Next, I would recommend putting the tape, a marker to circle the area where you want to make it possible to contact with the heat sink thermal pads and after carefully cut along the marked edge. Install the heat sink and the long plastic washer on protruding pins. Further, through the pressure plate m turn the screw. Well, the system is almost ready, but it was not there. The height of our test card is quite large, and it is much more than a reference solution, and the width of the upper radiator designed for the reference decision. And so came the upper radiator press only on one side. Just because of the height of the video card is not possible to install special reinforcement plate. Testing of the cooling system was held in 7 minutes load stress test FurMark 1.14.1.4. program settings were as follows: 1920 x 1080 resolution, Anti-aliasing 8X MSAA. 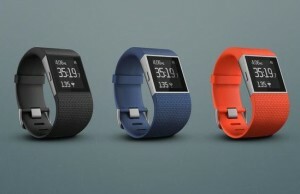 The noise level was held with a digital sound level meter from a distance of 15 cm. 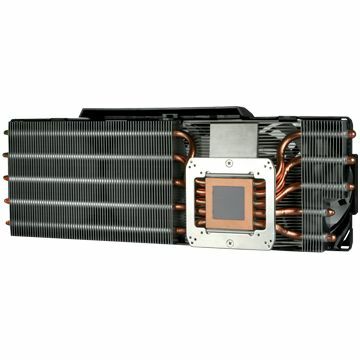 In comparison with the cooling system from the manufacturer Arctic Accelero Xtreme IV shows not so impressive results furthermore due to the lack of additional radiators temperature in certain test modes is significantly higher. I want to praise ASUS engineers for POSEIDON GTX 980 graphics card is really very interesting and very cool especially with water cooling. Of course, not all of the standard CO show such a good performance, but we did not pick up light competition. 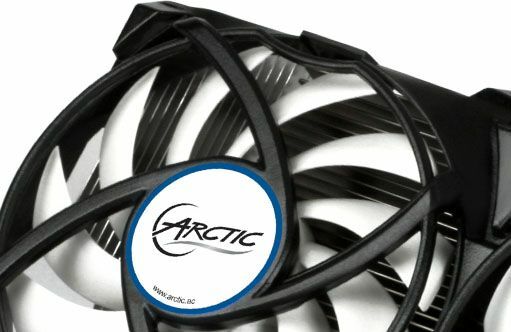 Compared with the cooling system from the manufacturer Arctic Accelero Xtreme IV objectively shows such impressive results that we would like to see. The maximum performance mode bypasses the hero of our review home cooling system from ASUS, but the fact is that in the DirectCU H2O only three heatpipes evaporation chamber and a water canal, so a victory here is not quite fair. Furthermore due to the absence of additional radiators temperature in certain test modes are quite high. I want to separate praise for ASUS engineers POSEIDON GTX 980 graphics card is really very interesting and very cool especially with water cooling. 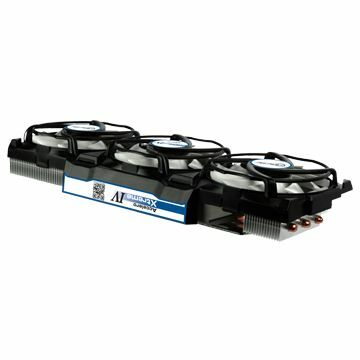 In general, the radiator Arctic Accelero Xtreme IV as good as the previous version. It provides excellent heat transfer from GPU, but with complete delivery in the fourth version has obviously serious miscalculations. Firstly, only a sharpening solutions. Secondly, the absence of additional radiators for memory chips and VRM. Third, install it without the unreasonableness of the upper radiator that due to the construction of more and turns in chetyrёhslotovy sandwich. Would add extra heat sinks and an extra set of nuts and bolts for mounting the top plate without the cooling system would be more versatile and interesting. Now, I’m inclined to think that if you choose between Arctic Accelero Xtreme IV and Arctic Accelero Xtreme III, I would advise you to look in the direction of the third version. I repeat once again, choose the Arctic Accelero Xtreme IV is just to replace a noisy turbine factory to change the conditional fine with not advisable, as the huge difference you will not see and will give money is not enough. It is doubtful looks Arctic Accelero Xtreme IV and Arctic Accelero Hibrid II without additional radiators for VRM and memory Bole to now they have become more and cover the slot on the graphics card which limits interoperability and thus the circle of buyers. However, the factor that such cooling systems are not stopped producing uniquely happy.